Son La (VNA) – A large area of rice and maize crops in the mountainous province of Son La is being attacked by a plague of locusts, which has occured for the first time in the locality after a similar phenomenon in 1975. Since the middle of May, the locusts, or more commonly known as grasshoppers, have munched their way through crops in Na Vac and Pa Kach villages in Muong Lan commune, Sop Cop district with an average density of 500 and even 600 hoppers per square metre. They are now spreading to other localities rapidly. The People’s Committee in Muong Lan commune has directed plant protection staff to guide locals in using pesticide to prevent the spread of the hoppers. 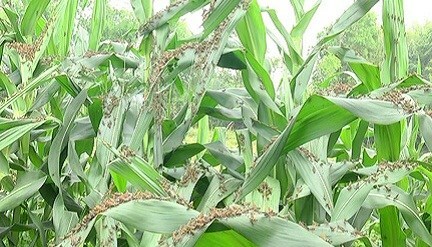 According to local farmers, the reason for the outbreak has been continuous rain in the past few days after a long duration of drought, which is a favourable condition for grasshoppers to multiply.